AVAILABLE NOW – Credit Card Linking! An ideal solution to increase card payments, reduce transaction time and remove the need for a physical loyalty card. Our credit card linking loyalty system is a frictionless and seamless process that allows customers to collect points when they purchase with their everyday credit and debit cards. This avoids any added time on transactions and requires no physical loyalty cards. It is also a great way to incentivise customers to pay by card rather than cash. 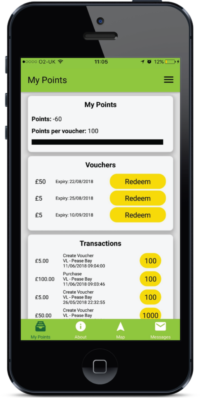 All customers points and rewards are tracked on an exclusive loyalty app built for your business by us! As a business you will also receive access to the loyalty marketing portal where you are able to send targeted messages to your loyal customers – including email, SMS, app messages and notifications. This system can work independently or alongside all our other solutions. Card Linking will only require a one-time, simple sign up for the customer via your business loyalty app. If you would like to learn more about this solution for your loyal customers please get in touch!